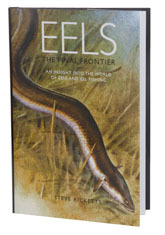 I can’t say that I am the world’s greatest fan of eels, but by the time I had finished Steve Rickett’s book, I was a convert. You have to respect a fish which can live into its eighties, hack it for forty eight hours out of the water, travel overland in search of new territory, find its way unerringly back home even when transported a dozen miles away, survive in both fresh and salt water, and possesses a sense of smell better than a catfish - and that is ignoring the 3000 mile one-way trip to spawn, an act that has never been witnessed. Eels really are impressive, although man’s treatment of them is not and it seems very likely that we will wipe out the European eel within a decade or so unless the Environment Agency gets its act together. The population has already collapsed to a very small percentage of its post-war level and as the price per kilo shoots up, the netting effort is becoming more and more intense, yet most of the people who eat eels know absolutely nothing about them. Well here are many, if not all of the answers to the questions you never dared to ask. Although there have been books about the eel, as far as I know, this is the first book written about catching specimen eels; just about the only thing which lets it down is the photography, most of which must have been taken long before a book was on the cards. Steve makes the point early on that modern fishing follows fashions and right now those fashions are labelled ‘carp’ and ‘barbel’ which have become the designer catches of the noughties. Catching big eels, on the other hand, involves outwitting a quarry no less sophisticated than the carp and at least as powerful as a barbel, with no chance of ending up hauling in a hand-reared stockie that has already been caught by half a dozen other anglers. The trouble is that most anglers’ experience of eels is limited to the bootlace jobs that knack your leader before climbing up the line and winding themselves fourteen times around the rod tip - big eels are a race apart. Big eels are old, probably older than you are, so they have plenty of time to learn, which means they are smart; they also have the most incredible sense of smell, good enough to detect the lead on your rig from several feet away. They have the acceleration of a scalded cat, an encyclopaedic knowledge of where the best snags are, and they have a bite like a crocodile; so all in all, there isn’t a better test of your skill. Call yourself an angler? Go eel, I say.